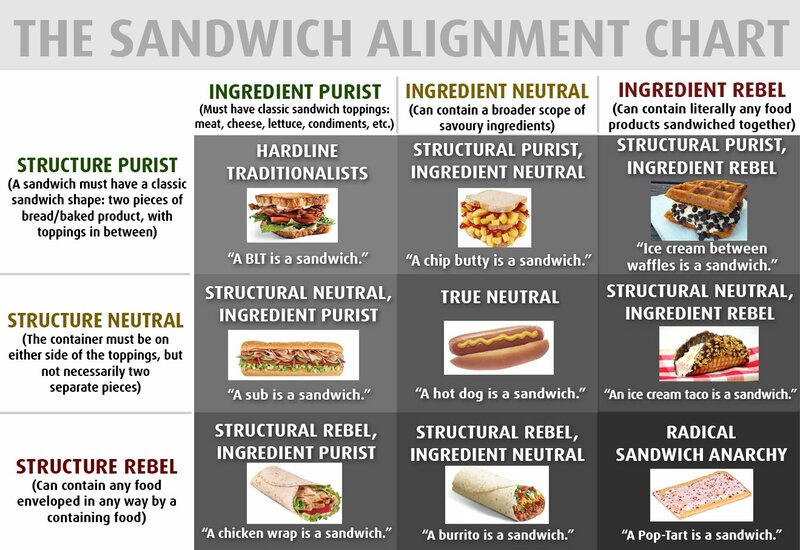 LITTLEBLACKDOG.COM :: View topic - Where do you sit on the sandwich alignment chart? Where do you sit on the sandwich alignment chart? Posted: Thu Apr 05, 2018 7:41 am Post subject: Where do you sit on the sandwich alignment chart? I have made sausage, egg, and cheese sandwiches with Eggo waffles. I never claimed I wasn't a heretic. Top of the 666 page!!! Is an open faced sandwich, in any way shape or form a sandwich? it's food on bread, but it's not food enveloped or enclosed by bread. Does that constitute a sandwich? If it does the next logical question, is what about a salad with croutons? what if the croutons are all at the bottom of the salad? At that point what is the significant difference between a salad an an open faced sandwich? I was just asking questions. It's all food as far as I'm concerned... the real question is, is it delicious? Sometimes when you stare into the sandwich, the sandwich stares back into you. it's got bread and stuff in the middle... it's a sandwich. If it doesn't use bread, it's something else. If it tastes good, it eats. A hot dog is a sandwich? Burrito? Pop tart? Ice cream taco? What is this world coming to? Dirty Deeds and-a done dirt cheap! Tuna salad with peanut butter and onions. The people in my life find it revolting. Take that bread and put it on a hot griddle open faced.